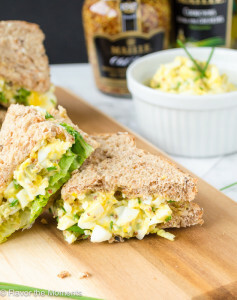 Easy French Style Egg Salad and a Maille Giveaway! Easy French Style Egg Salad is traditional egg salad livened up with french whole grain dijon, chopped cornichons, and fresh chives. It's fancy without being fussy! Place the eggs in a small sauce pan and fill with enough water to cover them by 1". Cover and bring to a rolling boil over medium heat. Remove from heat and keep covered for 12 minutes. Remove the eggs from the sauce pan with a slotted spoon and place in a colander. Rinse with cold water to stop the cooking process and until they're cool enough to handle. Peel, then roughly chop and place in a medium bowl. Place the mayo and mustard in the bowl with the eggs and stir gently until combined. Fold in the cornichons, chives, and salt and pepper to taste. Serve on whole grain bread, slider buns, or crackers. Enjoy! *I used Vegenaise as I prefer it to mayo. You can lighten this up by using Greek yogurt, or half mayo and half Greek yogurt. This recipe is easily doubled or tripled if feeding a crowd.